Writer, Sailor, Soldier, Spy by Nicholas Reynolds chronicles Ernest Hemingway’s time as a spy and his involvement in politics on the world stage during the years 1935 through 1961. As to credibility, Reynolds was a Marine for 30 years, worked for the Central Intelligence Agency (CIA), and eventually became the curator of the CIA Museum. He references 107 primary sources and each chapter is replete with citations to support his claims. While Writer, Sailor is almost certainly factually accurate, I am not certain this book entirely succeeds. The book chronicles some aspects of Hemingway’s personal life such as his downward spiral into depression, his four wives, and his extremely excessive alcohol intake; though this is not news, nor is it the main point. Reynolds also tries to tie some of Hemingway’s writing to his wartime experiences, particularly with For Whom the Bell Tolls and his time in Spain during the Spanish Civil War, and then his final book, The Old Man and the Sea. He also name drops quite a bit. For example, correspondence with Archibald MacLeish and his friendship with John Dos Passos are frequently referenced. The book tells of Hemingway’s love of Cuba and briefly alludes to some interactions with Batista and Castro. But, again, there is not much new ground covered here. What would be considered new ground for most is Hemingway’s dalliance with the Soviet NKVD, the precursor to the KGB, and involvement with the American OSS, the predecessor of the CIA. Hemingway was not a Communist, and perhaps not even a Socialist, but he hated Fascism and during the 1930s was disappointed in America’s lack of resolve to fight against it. He was particularly upset with the Pearl Harbor attack, which he believed was due to complete negligence on the part of the American government. Hemingway’s travels during this time are discussed. How he managed to get around on both official and personal business is interesting at times. One of the most interesting stories is the chapter on Pilar, Hemingway’s cabin cruiser, and its role as a spy ship in 1942 and 1943. This would prove to be the most significant of Hemingway’s wartime adventures. Most Hemingway buffs and literary scholars would find nothing of interest in this work. But while it succeeds in chronicling his adventures – and there are some interesting tidbits to be gleaned among the way, the truth is that Hemingway’s involvement as a spy did not seem to lead to any major intelligence that impacted the outcome of the war – or particular battles – in any way. If so, it was not evident in the pages of this book. Recommended, with the reservation that the book seems to promise more than it delivers. Dave Moyer is a public school district superintendent and is the author of Life and Life Only: A Novel. What could be more wholesome than a yoga studio/vegetarian cafe in a small English village? Everyone knows everyone else; Keeley Carpenter, the proprietor of said studio/cafe, is dating Ben Taylor, the local detective. The bucolic atmosphere in town abruptly shifts when a prominent citizen is found murdered. Of course Keeley, who is a curious and bold young woman, jumps right in and does some detecting of her own. It’s a recipe for danger! This book has a bonus feature. Scattered among the chapters are instructions on yoga poses. The most appropriate entry is corpse pose, which is located at the end of the chapter in which the murder is discovered. Death at the Yoga Cafe is the second book in a series featuring Keeley Carpenter. The era is the 1920s and the action takes place in and around New York City. Widowed socialite Lola Woodby and her former cook Berta Lundgren have teamed up to form a business, the Discrete Retrieval Agency. Lola’s husband died leaving her penniless after years of enjoying the high life. Their cases have mostly focused on finding lost pets for well-to-do clients. A high stakes case finds its way to their office/apartment. A diary belonging to the daughter of Lola’s mother’s best friend must be purloined. The revelation of corruption, war crimes, envy, greed and determination uncovered by the lady detectives are timeless, yet author Chance makes them fun to read about when mixed with her wry, droll humor. This book, the seventh in the Wine Country Mystery series, is heavy on detail regarding grape growing, wine production and family dynasties in present day Virginia and California as well as both locales during American Prohibition. The lives of many of the characters are interwoven both in the past and the present. Lucie Montgomery inherited the family estate vineyard in Virginia and she is determined to produce a high quality product. Her comrade in wine making is Quinn Santori, a fellow with a closely guarded past. Together they face some rather harrowing scrapes with death while planning the bottling of a sparkling wine, a new addition to their carefully crafted line. Readers new to Crosby would doubtless appreciate a bit more character introduction. The charming fourth installment of the Cornish Mystery series set in the 1970s is an escape to a bucolic area of the United Kingdom where the pursuit of criminals requires the navigational skills of local fixture, Eleanor Trewynn. Ms. Trewynn is a retired executive of an international nonprofit agency who now gathers donations for a local thrift shop. Her skills at cross-border negotiation are what lead to involvement in a secret conference regarding apartheid held by a friend in the Commonwealth Relations Department. Ms. Trewynn’s niece, Detective Sargent Megan Pencarrow, is to provide security at a hotel on the coast. There are evil spies who want to derail the event. 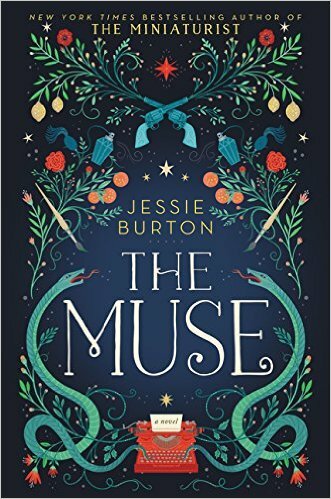 One crime leads to another and the reader is brought along for a wild ride through the Cornish countryside while the bad guys bumble along back lanes and impassible roads just ahead of the police. 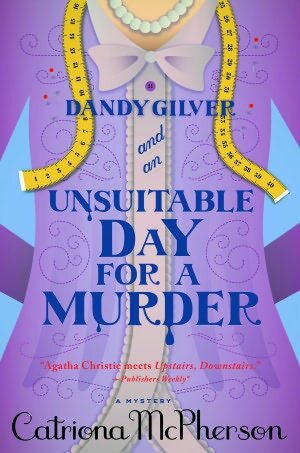 This 1930s British murder mystery from Catriona McPherson featuing Dandy Gilver and her partner in detecting Alec Osborne will delight readers. Dandy and Alec have been working together for eight years; however, the outlandish predicaments these two willingly take on here are by far the best of the series. Christmas time or not, the two accept a job from Mr. H. Birchfield, an importer and distributor of fish, herring to be precise. The partial remains of a human have sullied a barrel of his product. Birchfield wants Dandy and Alec to travel to Banffshire coast and solve the “who” and “why” of this creepy occurrence. Never mind that Christmas is but a few days away and Dandy will miss celebrating with her husband and sons. The treacherous cliffs along the seacoast, rain, wind and seriously inbred inhabitants make for ideal subjects of this the fifth in author McPherson’s series. Be prepared for laughs and groans as she fills the pages with puns and outlandish characters! Con Lehane presents the first mystery of his new series featuring Raymond Ambler, a mild mannered librarian at the world famous 42nd Street research library located at 476 Fifth Avenue in New York City. Ray, as his coworkers refer to him, is the curator of the crime fiction collection. While the collection is a figment of Author Lehane’s imagination as is Ray’s boss’s office, the rest of the library is accurately depicted in stunning detail. Who knew that a cold blooded murder could take place within the hallowed halls of the glorious Beau Arts building that is guarded by two fierce lion statues? The lives of several famous and infamous mystery writers are tangled into a confounding web of murders and past evil deeds. This is no breezy read because the details matter and not all the clues lead to a convenient solution. Hold on to your hats Wild West fans! The improbable mix of Berlin, Germany and fans of American frontier lore are at the center of this wacky murder mystery. Dinah Pelerin is the heroine of this tale. She has a lover who is a former Norwegian cop and her mother, Swan, is a Native American from the Seminole tribe. 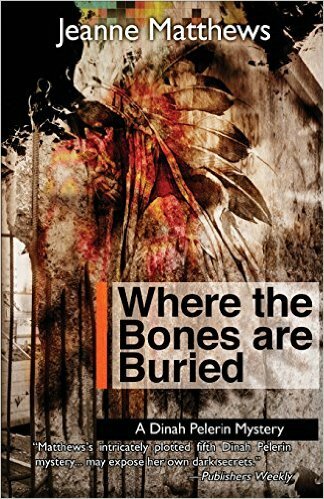 Author Jeanne Matthews presents a deeply puzzling death amid a powwow event held by the Berlin Der Indianer Club. Who knew that Native Americans might fascinate Germans? At least this explains how Dinah has a gig teaching Native American cultures in Berlin. This is Dinah’s fifth appearance in the series so there’s a fascination with her by mystery lovers. Swan is a rather tricky character who’s out to get revenge. She visits Dinah in Berlin and together they manage to get themselves into some very tricky predicaments after finding a scalped murder victim. 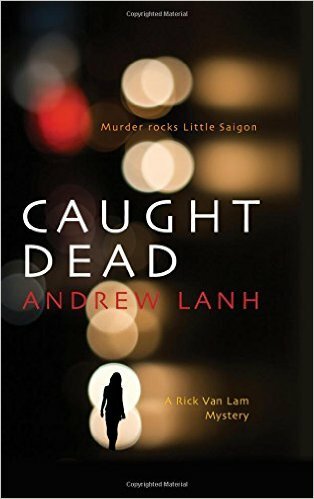 Recommended for mystery lovers who are looking for a fresh perspective on murder. The tale is told in a breathless, naive way that is heavily laden with racism both external (Vietnamese vs. others in Hartford) and internal (mixed race children who are a product of the war in Vietnam vs. pure blooded Vietnamese). The clashes also include tensions between Buddhists and Catholics and, of course, the rich and the poor. There’s a bit of meandering for Rick as he searches for a motive to explain Mary’s shooting. The complexity and conflicts he encounters make this somewhat of a laborious read. This would likely be an unlikely selection for the typical reader. And now, back to our regularly scheduled mystery style – British mysteries of the 1930s, in other words, true classics! Poisoned Pen Press has brought back out-of-print mysteries that were popular in their day. This selection features Bobbie Cheldon and his nightclub dancer crush, Nancy Curzon. Bobbie is the lazy and self-centered son of a widowed mother. His uncle, his deceased father’s brother, is a wealthy tightwad. Bobbie longs for the day when he inherits his uncle’s fortune. The book is written in fascinating syntax and figures of speech that draw the reader back in time. Make no mistake, there’s no casual cruising through this text. 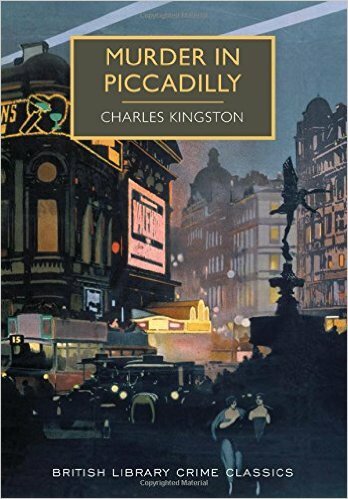 The reader cannot afford to be lazy or skim as the charm and humor of Charles Kingston’s writing style will be missed. Members of the British caste system in its many permutations interact throughout the tale to form a truly tangled web of greed and deceit. Highly recommended for purists who devour classic British mysteries! Review copies were provided by the publisher and/or a publicist. Dandy Gilver is a proper lady living in Scotland during the 1930s. 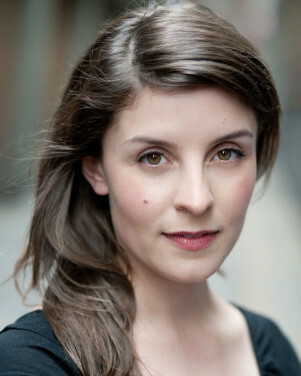 She is also a detective married to a respectable nobleman and the mother of two sons. Dandy is the narrator for this series of remarkably detailed and charming period pieces. Unsuitable Day is the latest in the series written by Catriona McPherson, who was born in Scotland and now resides in Davis, California. Readers who delight in location details, period pieces and wicked humor are the audience for this book. There are red herrings, plot twists, gruesome murders and a bit of class warfare that make each page an experience in itself. Author McPherson’s writing is dedicated to immersing the reader in all things Scottish and particularly those of a small nature. Perfect escapism is rarely presented in a murder mystery. There are usually jumps in the story line that create ambiguities to throw the reader off the trail of the killer. Being thrown off in that way has a tendency to break the spell. Unsuitable Day goes in the other direction. There are so many specifics and events that the reader is transported straightaway to the other side of the ocean and into the past. This reviewer lost track of time during the reading of the book. Perhaps that’s due to the lack of technology in the story, or maybe it’s the fascinating details related to running a department store in post-World War I. Regardless, the escape happens and not only will future episodes be welcome, maybe a bit of catching up with Dandy’s past escapades is in order. Who knew that Cleveland, Ohio could be so interesting? Lisa Black, a member of the National Academy of Forensic Sciences, proves that there’s more to Cleveland than the Rock ‘n Roll Hall of Fame. Her third Theresa MacLean book is not only set in this Midwestern city, it features some really gory murders that are based in fact. Black’s main character is a forensic scientist who happens to belong to a family with a history of crime fighting all the way back to her grandfather. When present day murders bear a striking similarity to Cleveland’s most horrific killing spree during the 1930s and 40s, the city police and coroner’s offices are summoned to cut short the present day nightmare. Theresa and her cop cousin Frank are at the center of the action. Yes, Theresa takes more than her share of risks; however, she also uses her instincts to get out of peril. There are plenty of false leads and hints to keep the reader guessing right up to the end of the book. There are several other mystery/thriller series written by expert authors that feature main characters with similar talents. The most notable of these is the Kay Scarpetta series by Patricia Cornwell. Black unfolds Trail of Blood as a more personal story with less ostentatious criminology and more good-old-fashioned shoe leather detecting than does Cornwell. In addition, the story is actually told in multiple time frames, current day and 75 years ago. Black is excellent at keeping it real. The mix of accurate historic details, a map up front in the beginning of the book and a detailed timeline of the original murders set this book apart from the rest of the pack. Well recommended for fans of thriller novels that actually have more than just gore to offer. A review copy was provided by the publisher. 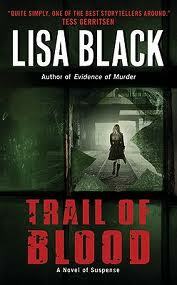 Trail of Blood was released in a Mass Market Paperback version on July 26, 2011. “Quite simply, one of the best storytellers around.” Tess Gerritsen, author of the Rizzoli & Isles novels. Lisa Black’s new novel, Defensive Wounds, will be released on September 27, 2011. There are several other mystery/thriller series written by expert authors that feature main characters with similar talents. The most notable of these is the Kay Scarpetta series by Patricia Cornwell. 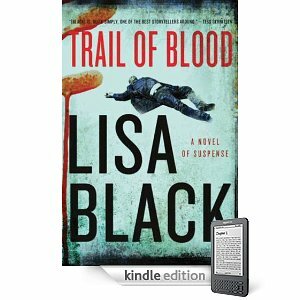 Black unfolds Trail of Blood as a more personal story with less ostentatious criminology and more good-old-fashioned shoe leather detecting than does Cornwell. In addition, the story is actually told in two time frames, current day and 75 years ago. Well recommended to fans of thriller novels that actually have more than gore to offer. This review was written by Ruta Arellano. A review copy was provided by the publisher.